Home theater accessories like pillows and blankets are great add on to a home theater seating purchase or for use on the sofa. These are high quality pillows and throws to help bring the comfort to the theater. 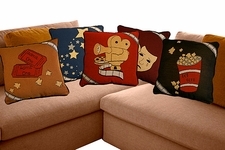 The theatrical throws and pillows are a higher quality accessory. We highly recommend them as the stuffing and stitching is first rate. High quality projector home theater pillow. The Professor shows of the pillow 18 inches square. Excellent fabric with high thread count. Throw blankets are a great addition to the theater. 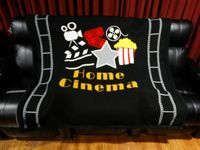 We show off the home cinema themed blanket. Large high quality blanket.